Spring has sprung. Sure, I live in LA, where a sunny day could just as easily mean December as it could April. People are always exhibiting various degrees of suntan (usually related to their house’s proximity to the beach), and flip flops are a year round fashion statement. Fortunately, I like to frequent the farmers’ markets (particularly the Hollywood Farmer’s Market, which I think is the best farmer’s market in Los Angeles), and the signs of spring are unmistakeable. Strawberries are a big tip off, trucked in from Oxnard, and so are the lilacs that are only around for the early birds. The very first tomatoes are appearing, but the vegetable that says “spring” to me is asparagus. The thin and tender stalks are all over the market. Now, I love steamed asparagus with a little hollandaise, or roasted asparagus with olive oil, but sometimes I just don’t feel like going to the effort that steaming and roasting require. (And don’t ask me why it seems like a big deal to turn on the oven or dig out the two part steamer, but it does). That’s where pan sauteeing comes in. 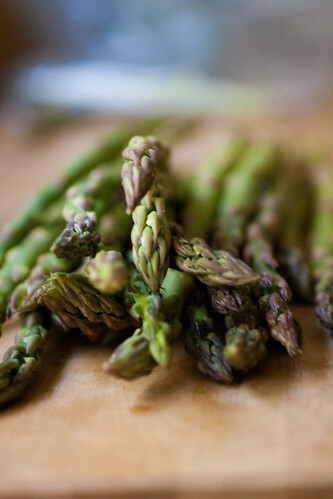 You don’t need a special asparagus cooker or a hot oven. Just a skillet, a little butter, and some quick knife work, and you have a dish fit for a king. The asparagus stay bright green and tendercrisp, with the flavor being undimmed by high heat roasting and undiluted by water. I like to add some leeks for a mellow oniony bite — the combination is really fantastic. Topped with some curls of sharp and grainy parmiggiano, this dish is simple, quick and delicious. Cut the tips off the asparagus and the roots and greens off the leeks, leaving about an inch of green on the leeks. Wash the leeks thoroughly and slice lengthwise, then thinly slice each half. Cut the asparagus into a rough chop, leaving the asparagus tips intact. Melt butter in a saute pan, Add the leeks and asparagus and a pinch of salt, and cook over medium heat, stirring frequently, until the vegetables are tender. Serve garnished with curls of parmesan. My current favorite cookbook is Ad Hoc at Home – but my favorites change on on a monthly basis, I think. Ah, it will be a while before we get asparagus (we grow our own). My favorite cookbook would have to be The New Best Recipe by Cooks Illustrated. I am already a follower vis RSS. Thank you! My favorite cookbook is Williams-Sonoma’s “Simple Classics.” Everything I’ve made so far has been perfect, including my very first roasted chicken. And I’m now a Facebook fan. My current fave is Food Revolution as I work through it with my cooking club at school. I subscribe to your blog in my reader already. And I just tweeted about it ! I’m subscriber via RSS already. It’s so hard to narrow down my favorite cookbook – my go-to for basic recipes I can adapt is Better Homes & Gardens! I love my Joy of Cooking book – perfect for a base recipe to customize. I’m already a RSS subscriber! My favorite cookbook at the moment is Madhur Jaffrey’s An Invitation to Indian Cooking. I’ve had it for forever, but only recently mustered up the courage to try some of the really fantastic recipes in it. My favorite cookbook has to be Julia’s Mastering the Art of French Cooking. It was one of the first cookbooks I ever used. I follow you on Twitter and I retweeted the post! While researching the matzo ball piece, I came across Arthur Schwartz’s Jewish Home Cooking. I read it cover to cover. My favorite cookbook is David Lebovitz’ The Perfect Scoop. Yes, I’m embarrassed that it’s all about ice cream, but I have made a dozen recipes from here and all but two have been completely amazing (not just good, amazing), and I have more than a dozen on my list to try. How many cookbooks have track records like that? California Pizza Kitchen Cookbook. I don’t actually make many of the recipes; they’re all so complex. But I love drooling over the pictures…Pizza just happens to be my favorite food. Anything written by Ina Garten!!! And I follow you on twitter!!! I’m now a subscriber via email! My favorite cook book is Alice Waters The Art of Simple Food. Vegetarian Cooking for Everyone, Deborah Madison! Right now I am loving the Canal Series cookbooks – beautiful photography and recipes. Real home cooking! I just became a fan – even though I use to be, not sure why I was not on my FB account. Have always been a fan of yours, Kate! Right now my favorite cookbook is C is for Cooking. Yes, it’s a sesame street cookbook. But hey, my kids will eat the food in it. Or some of it, anyway. And… I’m an RSS subscriber! My current favorite cookbook is The Pioneer Woman Cooks. Lots of great recipes that will please my picky hubby! And I’m already an RSS subscriber. …and I just RTed your giveaway! joy of cooking, hands down. i’m a facebook fan, too! I subscribe on email, so enter me again! I’m an RSS subscriber! And I’ll have to get back to you about my favorite cookbook. a little boring but my fav cookbook is ad hoc. challenging and tasty. My favorite cookbook is the Leavitt Family Cookbook:)! These days, my favorite cookbook is the Herbal Kitchen by Jerry Traunfeld. It’s from the chef at a local restaurant (The Herbfarm) that I want to go to but haven’t yet. Lots of great ways to use the herbs I like to grow! Hard to choose a favorite cookbook, but I am very fond of Mario Batali’s Molto Italiano. The photos are beautiful and the recipes I’ve attempted thus far have all come out pretty dang tasty. Runner up? Ina Garten’s Barefoot in Paris. Just became your 210th fan on Facebook! Favorite cookbook is … this is hard! Um, ok Mark Bittman’s How to Cook Everything Vegetarian. Thanks for the contest! I’m definately a Cali girl, so I’m going with “The Los Angeles Times California Cookbook “. It has all the Cali flavors I love! Thanks for the awesome giveaway!!! I share you love of Le Creuset! Fantastic products! I am a google reader subscriber! I am a fan on Facebook (under a different name)! And I’m a Twitter follower and tweeted this giveaway! This is an obscure choice, but my favorite cookbook has to be The Georgian Feast by Darra Goldstein. Georgia-the-country has some incredible food, though of course it just doesn’t taste the same in recreation. My favorite “cookbook” isn’t one with actual recipes, instead it lists an ingredient and all of the appropirate flavor pairings for it. It is called The Flavor Bible and it is magical. Hrmmm. I learned how to cook from a combo of my mom and the Better Homes and Gardens New Cookbook, so I’ll go with that out of nostalgia. This looks delicious! I’m jealous of those slender and tender leeks, our farmer’s market is still over a month away! My favorite cookbook at the moment is the Everyday Food cookbooks by Martha Stewart. 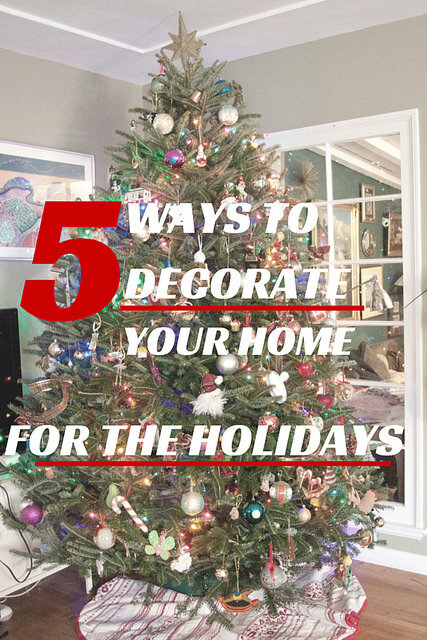 They are well put together, have great pictures, and fool-proof recipes. I’ve worked my way through the first one (which is organized by seasons…something I love since I like to cook seasonally) and just bought the 2nd one. They are excellent! Mmm this looks lovely and possibly a contender for the Easter side dish parade! I must say I am on a Il Viaggio di Vetri: A Culinary Journey by Marc Vetri kick myself. One can never have enough pasta, savory custards, or beautiful pictures. my favorite cookbook is Chez Panisse Vegetables by Alice Waters. I’ve been obsessed with Suzanne Goin’s Sunday Suppers at Lucques. It’s my new favorite cookbook because the recipes are delicious and just challenging enough to keep them interesting without being overwhelming. You are so right! Asparagus is most certainly a sign of Spring! And like you, I get to enjoy those Oxnard Strawberries. They are the best! I live pretty close to Oxnard, so we here really get them fresh from the farms. Currently (it changes) my favorite cookbook is How to Cook Everything Vegetarian by M. Bittman. Okie Dokie, I subscribed to your RSS…that was easy. Alrightie, just became a fan on FB. that piece about Sandra Lee is very funny! and entry four is done! Woo-Hoo! Already following you on Twitter, I retweeted about your give-away. Hope that counts. First time I’ve retweeted! Easy. Baking Without Eggs. Thanks for the giveaway! My fav cookbook is Vegetarian Cooking For Everyone by Deborah Madison. I just signed up via email to be a subscriber-love your site! Just added you on Facebook-yah! My favorite cookbook is Veganomicon! Wow Le Creuset in the SS buisness, guess they found they were missing a niche, but they are top notch when it comes to their pans. I expect no less either. 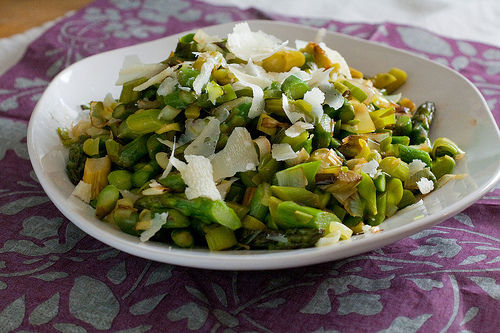 Asparagus is one of the healthiest green vegetables you can eat, so thanks for this little recipe. My favorite cookbook is One Bite Won’t Kill You by Ann Hodgman. It’s geared toward making food that children will eat, but it’s filled with humor and great recipes! I love asparagus. And you have such tender little leeks! Looks delicious! Any of my Cook’s Illustrated books – recipes have always all come out great. heading over to twitter now – good luck to me! Favorite cooking/recipe source right now is your blog! Hmmm, guessing that does not influence the random number generator. I’m an email subscriber and facebook fan. My favorite cookbook is “Morning Fires, Evening Lights: The Marlboro Country Cookbook”. I subscribe to your RSS on google. Favourite cookbook of the moment is Tender, A Cook & His Vegetable Patch by Nigel Slater. It has great recipes and growing advice for both Asparagus and Leeks. I’d love to win that pan. 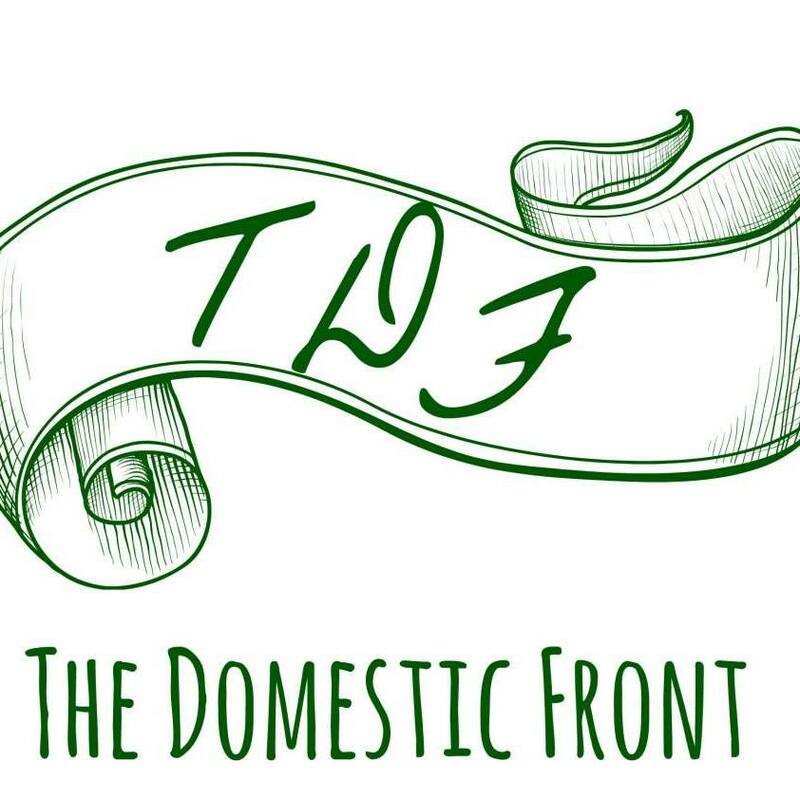 I’m a facebook fan of The Domestic Front! I retweeted about your giveaway! and I am already following you on Twitter! favorite cookbook…that’s a tough one. i do love joy of cooking for all the basics and info. My favorite cookbook right now (it’s always changing) is vegetarian cooking for everyone by Deborah Madison. It has been very helpful as I’m trying to incorporate more veggies in my diet! I also subscribed via Google Reader! I’d have to go with either Charcuterie (I love sausage-making) or Ratio. also? I just subscribed via email. My favorite cookbook du jour is The Appetizer Atlas. my favorite cookbook is nourishing traditions by sally fallon and i love asparagus…I am making this easter sunday, thanks for the recipe and chance to win a pan i soooo need! i follow you on my blog reader and currently have 3 tabs up with your recipes that i am making….thanks i love the deviled egg twist!!! I am an email subscriber and can’t wait to make the deviled eggs today! My favorite cookbook is The Therapeutic Chef. It’s a completely vegan cookbook, but a lot of the recipes are very good. My favorite cook book is Mom’s Best Meals. Finally picked my favorite cookbook! The Complete Italian Vegetarian Cookbook by Jack Bishop. 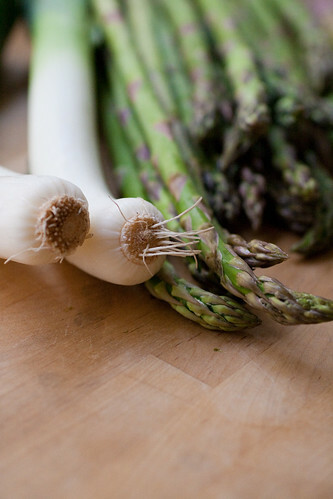 Mmm, leeks and asperagus are two of my favorite things!… My favorite cookbook? That’s a toughie. I must say Joy of Cooking, I don’t make anything straight from there but I do it as a springboard. I don’t have a favorite cookbook just yet. I admit, I get almost all of my recipes from blogs or recipe websites. Oh wow, a stainless steel Le Creuset sounds impossibly amazing. I am so exciting, foaming at the mouth actually 🙂 Well my favorite cookbook as of the moment, as it changes so often, is The Modern Baker by Nick Malgieri. His techniques and photography are so accessible and lovely, nearly foolproof. Thanks for the lovely giveaway Kate! I just picked up yet another bunch of asparagus. I swear, I could eat the stuff all day long, but I think roasting is absolute easiest way to eat them. Love this pan sauteed version. Adding it to the list…I bet it would be amazing with an egg on top! I just came across your site via Tartelette. I signed up as a fan on Facebook and am so excited to start following your blog. Everything I have read so far I have really enjoyed! My favorite cookbook right now is Jamie Oliver’s (all of them). Especially because of his current Food Revolution. I am an email subscriber. I am loving The Barefoot Contessa’s Back to Basics cookbook currently. I’m an e-mail subscriber and enjoy it a lot! I just subscribed to your email list. Pick me and give a college kid her first Le Creuset! My favorite cookbook is my trusty Martha Stewart Classics. Can’t beat the basics! Right now, my favorite cookbook is the Best of America’s Test Kitchen 2010. Lots of great recipes! I’m a follower on twitter and just tweeted. I’m @juliebakes. My favorite is Sylvia’s cookbook from Sylvia’s Restaurant in Harlem NY. I just became a fan of your website on facebook! My favorite cookbook… I have sooo many, but right now I’ll pick Simple essentials chocolate from Donna Hay. 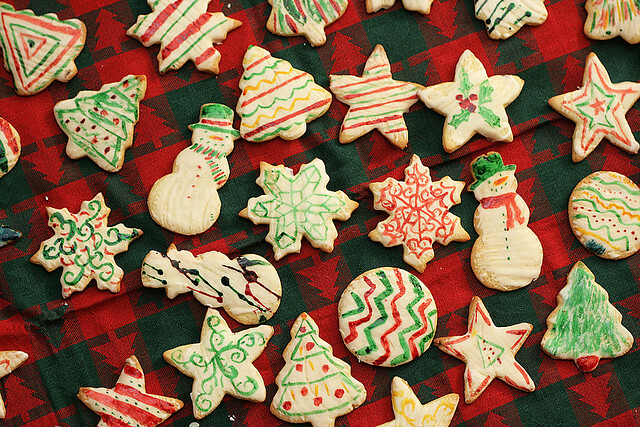 Love the recipes and pictures! Thanks for the opportunity to win that great pan! I am a fan of Le Creuset also. My favorite cookbook by far is the Lee Bros. Southern Cookbook. And I read your blog to him and make him get me recipes from it. I have to try this…it looks so good. My favorite cookbook is my own! I print out recipe from the internet and organize them in binders using clear plastic sheets and tabs. Beautifully simple recipe, love it! I think my favorite cook book is Joy of Cooking, not really because of the recipes, but the information and resources. Its so difficult to pick a favorite cookbook, there are so many good ones! But one I go to very often is The Bread Bible by Rose Levy Beranbaum. I use it to turn out the weekly (heavenly) bread! I also now subscribe to your page via Google reader. I found your site through Tartelette. I can’t wait to explore it more! I’ve actually been finding a lot more recipes online lately – via Tasty Kitchen, All Recipes, Epicurious and assorted blogs. I love asparagus, but it doesn’t come in season until early May up here. Thankfully, my ILs have a huge asparagus patch, and we always get three or four bag fulls from them. Favorite cookbook- that’s too hard to pick, but the cookbook that I have been using the most right now is Jack Bishop’s Year in a Vegetarian Kitchen. I love Sue Gregg cookbooks but also like Nourishing Traditions. My favorite cookbook currently is Real Cooking by Nigel Slater, I just got it so haven’t tried any recipes yet, but everything looks mouthwatering! I tend to get a lot of my recipes online and don’t use cookbooks too much. I have my grandmothers recipe file that I love to use. I subscibed to savou-fair via email. My latest favorite cookbook is Martha Stewart Entertaining because I am getting ready to cater a wedding in a few weeks. No one does fancy food for crowds like Martha! @Savour GR8T give away http://www.thedomesticfront.com/2010/04/02/sauteed-asparagus-with-leeks-and-a-giveaway/#more-988 – love it!